The Bloomberg building. That stunning pile under construction since 2010 beside our beloved Mansion House at the centre of City-life. 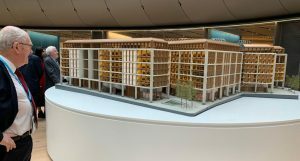 We have watched progress, peeping through the windows in the hoardings, marveling at the plans to reconfigure the 2000 year old Mithras Temple and then enjoying the final revealing of Bloomberg’s European HQ in London. So when Master Shravan gave us the opportunity to visit we jumped at the chance. His position as a Common Councillor on the Corporation’s Planning and Transportation Committee ensured a warm welcome for our group of 20 Fuellers. The morning came and we rode the new escalators to the new ‘Walbrook’ Exit from Bank; looped around the corner past, the bronze artwork ‘Forgotten Streams’ that pays tribute to the almost-lost Wal Brook, and on into the spacious vastly high-ceilinged Bloomberg reception. We were impressed with our reception committee. Chris Trott, head of sustainability for Foster+ Partners was on hand to show us this masterpiece, winner of the 2018 RIBA Stirling prize as well as multiple other awards. Ali Mason, Bloomberg guest relations, opened proceedings with a personal welcome and all the detail. This is the first time that Bloomberg’s 4000 London employees have been under the same roof. Chris described the build as a happy project citing the speed and ease of decision making and willingness to create innovative design. The ease of relationships would have benefitted from Michael Bloomberg’s hands-on involvement together with that of Chris’ boss the creative genius Norman Foster both of whom came to site several times a month. 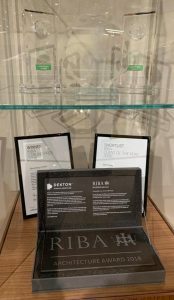 Construction was full of innovative and patented inventions, products sourced in the UK and rarely abroad, 95% of demolition materials were recycled or re-used. Fascinating and intricate petal-leaf design ceiling panels provide the heating, cooling, lighting and acoustic functions. All designed and made in Wales. A saving of 35% of energy through an on-site Combined Heat and Power generation centre. Design-led features offer employees more movement and interaction in the work place eg. stand/sit desks; a fabulous central walkway of a 3-person width with easy shallow steps that guide you gently up through the middle of the building. Bespoke radial desks allow privacy, personalisation. Limited dining facilities to encourage the workforce to use the entrepreneurial local café culture. Eight pieces of major artwork donated by Bloomberg Philanthropy. 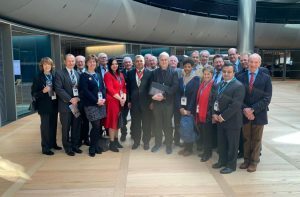 A fascinating tour demonstrated pride in this very special building which also houses Bloomberg’s iconic TV studio cleverly using the stunning view of St Paul’s as the backdrop. Tour over we moved briskly from the sublime to the historic. 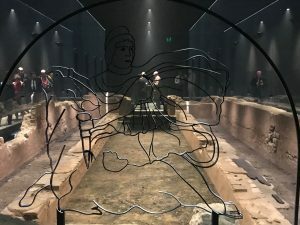 Many metres down below the ultra-modern workspace lies the ancient site of the Roman’s Mithras temple now reconstructed on the original site after upheaval following the clearance of London in the 1940’s and 50’s. Excavations then and now have produced massive evidence of the Roman’s use of this space including, excitingly, the very first written evidence of the address – Londinio. The temple is open to the public and school groups regularly. Well worth paying a visit just to get a feel of the beating heart of 2000 years of our history. 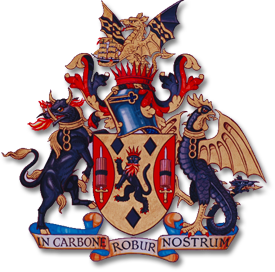 Thank you Master for enabling this visit and arranging a convivial lunch for us at the Candlewick in Chancery Lane.